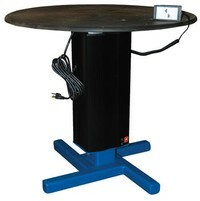 These turntables with powered height adjustment allow the operator to raise or lower turntable to an ergonomic height. Each unit has a 360 degree manual turntable. AC power, 115V, 1 Phase with hand control for height adjustment. Height is adjusted with with an electric linear-actuator.